If you don't like what these charts are saying, please notify The Washington Post to add the St. Louis Federal Reserve to its list of Russian propaganda sites. Yesterday I described our gaslight financial system. Today we'll look at our gaslight economy. Correspondent Jason H. alerted me to the work of author Thomas Sheridan ( Puzzling People: The Labyrinth of the Psychopath), who claims to have coined the term gaslighting. As noted yesterday, gaslighting has often been used in the context of personal relationships to describe a manipulative person's attempts to undermine and control their romantic partner. 1. Questioning, belittling, discounting and undermining our experience of economic "animal spirits" and general conditions. 2. Overwriting our memory of the economy of the past, again by undermining, questioning and belittling our memories. 3. Discrediting and marginalizing our definitions of economic well-being, in favor of the manipulator's definition of our well-being. 4. Using authority and "experts" to disqualify and discredit dissenting views. 5. Denigrate and deny our lived experience of economic conditions by repeating the institutionalized authority-approved narrative of "what actually happened." 6. Disorient, discredit and destroy dissent with a torrent of false statistics, false narratives, false accusations and false claims of our errors. It seems obvious to me that we are being gaslighted to forget the widely distributed prosperity of the past and accept that the stagnation of the past 16 years is equivalently prosperous--in direct contradiction to the lived experience and memories of the bottom 80%. Please compare the following four charts of unemployment, real hourly pay, inflation and full-time jobs with your economic experiences of the past two decades. The mainstream media and financial media are saturating us with claims that the economy is doing great: unemployment is a historically low 4.6%, real wages rose an astonishing 5% this year, millions of new jobs have been created, interest rates are at all-time lows, inflation is subdued and all in all, the U.S. economy is doing great--and if you disagree, well, you're a Russian propagandist because legitimate dissent is impossible. Here are the charts that illustrate our phony gaslight economy, with my notes.Please note the charts are from that well-known website of Russian propaganda, the St. Louis Federal Reserve (FRED). Over the past 60 years, an unemployment rate of 4.6% correlated with a booming economy of strong job growth and rising wages. Do you think the economy is booming, outside of hotspots such as San Francisco, CA and Portland, OR? The top 5% have done very very well over the past 16 years, but what about the bottom 95%? 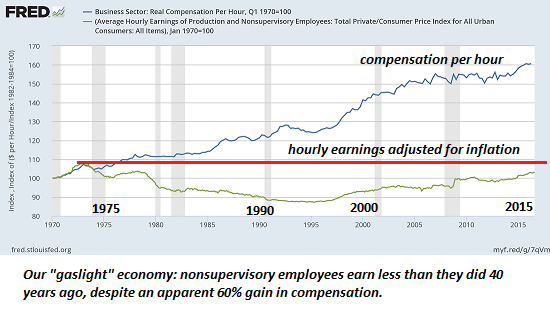 While hourly compensation has gone up 60% since 1970, when adjusted for inflation it has declined. If this is prosperity, then what does stagnation look like? Here's a chart of full-time employment. Does that tiny blip higher after eight years of "recovery" look like a widely distributed boom to you? What else can we make of the vast gulf between the status quo's ceaseless projection of "the economy is strong" and these charts--and our own experience? As for memory-- those of us who have been working for the past 40+ years recall real prosperity--and the past eight years are not at all like periods of prosperity in the past. Rather, the few at the top have amassed vast wealth while the bottom 95% have experienced stagnant wages and declining real wealth. Thank you, Lloyd S. ($5/month), for your superbly generous pledge to this site -- I am greatly honored by your support and readership. Thank you, Harvey D. ($5/month), for your splendidly generous pledge to this site -- I am greatly honored by your support and readership.